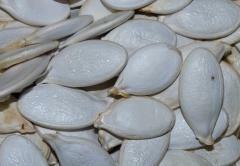 Pumpkin grade Bulgarian (Ladies' nail). This grade grows at bush. 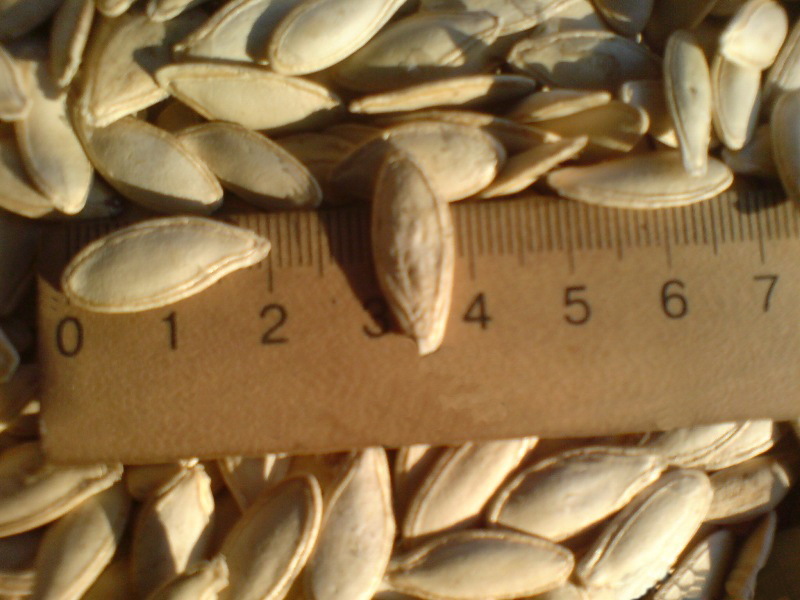 Rasstoryaniye of seeding between ranks 0,7m. Productivity of grade the Bulgarian to 1,7 tons from 1 hectare (with watering), without watering - to 1 ton from 1 hectare. 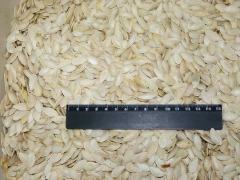 Norm of seeding on 1 hectare - 7 kg of seeds. It is useful to know! 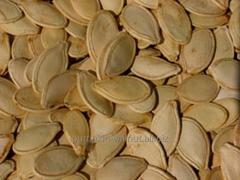 Preparations on the basis of seeds of pumpkin possess wide range of effects. 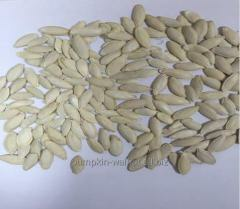 Seeds of pumpkin are effective to some extent against different tape worms (bull, pork and karliky tapeworms, wide tape-worm and dr). 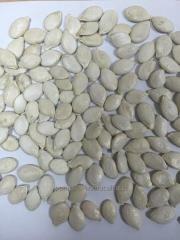 At the same time seeds of pumpkin not only are useful in respect of treatment, but also very much kaloriyna. 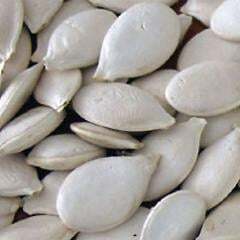 Seeds of pumpkin contain up to 52 percent of oil and to 30 percent of protein, salt of zinc and it is a lot of vitamin E. Pumpkin seeds contain both many different amino acids, and the vitamin E preventing presenilation and stimulating functions of gonads. Oil of seeds of pumpkin has antioxidant, anti-sclerous, antiulcerous, gepatoprotektorny, zhelchegonny, anti-dysuric, antiatherosclerotic effects. It is applied at cirrhosis and dystrophy of liver, hepatitises, holetsistokholangita, dyskinesia of zhelchevyvodyashy ways; stomach ulcer of stomach and duodenum, gastritis; lipidemia and atherosclerosis; to prostate gland adenoma Pumpkin very tasty and useful vegetable which contains large amount of carotene and vitamins. the pulp of pumpkin contains a lot of vitamin D, valuable to children's organism, which strengthens life activity and accelerates growth of children. cellulose of this vegetable is easily acquired even by the weakened organism, here therefore pumpkin dishes recommend for medical and preventive foods. as in pumpkin there are a lot of salts of copper, iron and phosphorus which positively influence process of blood formation in organism, its use is recommended as prevention of anemia and atherosclerosis. 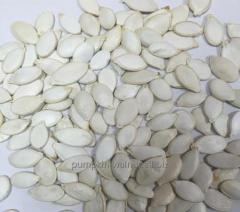 pumpkin is useful also at disease of liver and kidneys. pumpkin the excellent regulator of digestion and due to high content of pectin promotes removal of cholesterol from organism. 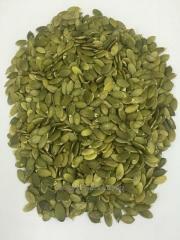 Unbelievable price on Seeds of Ladies Nail pumpkin (Bulgarian), pumpkin sunflower seeds, pumpkin seeds, Ukraine, Export. in Cherkassy (Ukraine) company Nikolaj Anatolevich, ChP. Семена тыквы "Дамский ноготь" (Болгарка),тыквенные семечки, семена тыквы, Украина, Экспорт.Seeds of Ladies Nail pumpkin (Bulgarian), pumpkin sunflower seeds, pumpkin seeds, Ukraine, Export. "Kürbiskerne" Damen Nagel "(Bulgarisch), Kürbiskerne, Kürbis Samen, Ukraine, Export.Semillas de la calabaza "la uña De señora" (la Búlgara), las semillas de calabazas, las semillas de la calabaza, Ucrania, la Exportación.Насіння гарбуза "Дамський ніготь" (Болгарка),гарбузове насіння, насіння гарбуза, Україна, Експорт.Doamnelor "Seminţe de dovleac" unghii "(bulgara), export de seminte, Ucraina, seminte de dovleac, dovleac.Prego das senhoras "Sementes de abóbora" "(búlgaro), exportação de sementes, Ucrânia, sementes de abóbora, abóbora. "Kabak çekirdeği" bayanların tırnak "(Bulgarca), kabak çekirdeği, kabak çekirdeği, Ukrayna, ihracat.Chiodo del Signore "Semi di zucca" "(Bulgaro), esportazione di semi, Ucraina, semi di zucca, zucca.مسمار "بذور القرع" السيدات "(باللغة البلغارية)، تصدير البذور، وأوكرانيا، بذور اليقطين، القرع.«تخمه» خانمها ناخن "(بلغارستان)، تخمه کدو دانه، اوکراین، صادرات.Köröm "Tökmag" női "(bolgár), tökmag, sütőtök magvak, Ukrajna, export.Семена тыквы "Дамский ноготь" (Болгарка),тыквенные семечки, семена тыквы, Украина, Экспорт. "Тиквено семе" Дамски нокът "(Българска), тиквени семки, тиквени семки, Украйна, експортиране.